The number of players to wear a Penguins uniform. The number worn by father and son combination of Greg and Ryan Malone. The number of Pens players that wore four different numbers. The number of retired numbers in Penguins history. All-time official Pittsburgh Penguins uniform numbers since October 11, 1967. Jersey numbers are for regular season and playoffs only. Mario Lemieux #66 was retired from November 19, 1997 to December 27, 2000. Lemieux officially retired on January 24, 2006. A new banner was raised at the home opener on October 5, 2006. 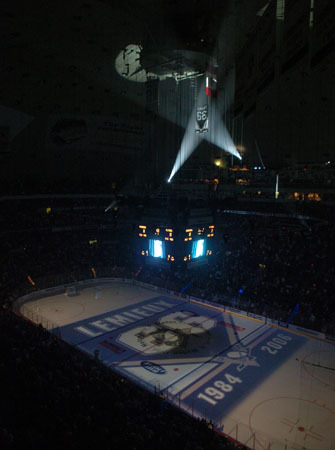 October 5, 2006 An image of Mario Lemieux’ retirement banner is projected onto the ice at the Mellon Arena before the start of the Pittsburgh Penguins hockey game against the Philadelphia Flyers in Pittsburgh. The ceremony capped a busy day for Lemieux on his 41st birthday. Lemieux’ number 66 was previously retired from November 19, 1997 to December 27, 2000. • Alex Kovalev wore number 27 in his first stint with the Pens and later, 72. • Six players wore #13 for the Pens: Jim Hamilton Charlie Simmer, Alex Goligoski, Bill Guerin, Nick Spaling and Nick Bonino. #13 was first worn by a pro player in Pittsburgh when Doug McMurdy wore it for the Pittsburgh Hornets in 1945-46. • Ryan Malone wore #12 in tribute to his father Greg, who wore that number for Pittsburgh. • Eric Meloche wore 72, the reverse of his father Gilles’ 27. • Philip Samuelsson wore #55, his father Ulf wore #5 with the Penguins. • Jaromir Jagr wore #68 to honor his grandfather who was imprisoned in the 1968 uprising in Czechoslavakia. • Sidney Crosby wears #87 because his birthday is 8-7-87. • Rick Tocchet selcted 92 thinking it would be the year of his career. He won his only Cup that year. A year later he bought his usual #22 from Paul Stanton. • Shawn Heins wore #57 as a play on his name and Pittsburgh icon Heinz ketchup. • John Cullen (11), Zarley Zalapsky (33), Robbie Brown (44), Mario Lemieux (66) & Paul Coffey (77) made up the members of the “Double Trouble” promotion. • #53 is the lowest un-issued number. • Only two numbers are officially retired: 21 & 66. #21 was uncirculated from 1970 and officially retired on January 5, 2001. #66 was retired from November 19, 1997 to December 27, 2000. Lemieux officially retired on January 24, 2006. A new banner was raised at the home opener on October 5, 2006.